Joanne pictured in her new home. HOMELESSNESS CHARITY THE Peter McVerry Trust today opened 13 new apartments for families and children affected by homelessness in Dublin’s city centre. The apartments were delivered in partnership with the Housing Agency and Dublin City Council and are made up of seven two-bed (for families) and six one-bed (for adults) units. The apartments are all expected to be occupied in the coming weeks, with all units expected to be filled before Christmas. Commenting on the opening today, PMVT CEO Pat Doyle said he was “a great day to be in a position to hand over a set of keys to a new tenant knowing that they have left homelessness behind for good”. “These 13 units launched today have been secured through our partnership with the Housing Agency, who have helped us to bring back these long-term vacant units as part of their €70 million rolling fund, to acquire and then sell on units to approved housing bodies,” he said. Latest homeless figures show that there are now collectively 9,724 people living in homeless accommodation across Ireland. Two young single mothers who have spent years living in emergency accommodation with their children will be moving into the apartments this week. Joanne was put into foster care with her siblings when she was 14. She spent the later part of her teenage years living in foster care, before moving into teenage support centre when she was 18. Joanne said she wasn’t able to stay in the centre for a variety of reasons, and so started couchsurfing with people she knew, before declaring myself homeless. “It was hard because you didn’t know whether you were invading people’s space or you felt like you were in their way all the time and you… I just felt like… it got me down because I just wanted my own space and I could never have that,” she said. Joanne has spent the last two years living in a hotel with her two very young children. This week she will move into her new home in the apartment complex in Dublin city, operated by the Peter McVerry Trust. Speaking to reporters today at the kitchen table of her new home, Joanne was overcome with emotion when asked what it meant to her to have a home for her family. Later she said it was impossible to describe the feeling. “I can’t describe the feeling. Just to know that I have somewhere to go. That I can now live a proper life with my kids… It’s just unbelievable,” she said. A few floors down from Joanne’s apartment, Jade was also looking at the new home for her and her two children. Jade (24) has spent the last two years living in a hotel with her children (age five and two). Before this, the young single mother had lived with her mother in an overcrowded house. When the situation became too difficult, she said she had no choice but to move out. She said the last two years had been extremely tough on her and her family. “It’s been very bad. You get really bad days where you just want to give up,” she said. 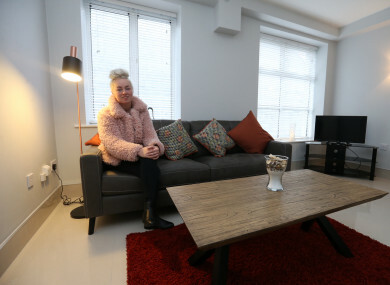 Jade said that living in emergency accommodation had been particularly hard for her children, but that they were delighted with the new apartments. “My little girl stayed up with my mam because she never used to like the hotels,” she said. “She came in here yesterday she loved it straight away when she seen it. She knew straight away she was home, and my little boy is only two but I knew by his face he was smiling trying to get back into the bedroom and stuff. “For them to get it was just great. I don’t even care about myself anymore. It’s more for them, you know? Ah they were so excited. And I didn’t even think my little boy would appreciate it… But he was so happy. Jade said that things like having a cooker to make her own food in were what stood out to her when she saw the kitchen. “When I’m in the hotel I’d just look after the kids. I’d be bathing them or ordering for them and before you know it it’s 10 o’clock and they’re in a bad routine. You’re after feeding them out of a chipper you know, it’s horrible. When I saw a cooker, I was like ‘I can’t wait to turn on that cooker’. It’s so weird but that’s all I want. Email “'I can't describe the feeling... Just to know that I can now live a proper life with my kids'”. Feedback on “'I can't describe the feeling... Just to know that I can now live a proper life with my kids'”.